The Atlantic Council for International Cooperation (ACIC) is excited to partner with the Government of Canada Sustainable Development Program (Employment and Social Development Canada) in an exciting national initiative, which seeks to gather information and feedback from Canadians to inform the national strategy on the implementation of the Sustainable Development Goals (SDGs) in Canada. We are inviting individuals and organizations who are actively involved in youth engagement to provide input into the important discussions which will contribute to the national strategy on the SDGs. 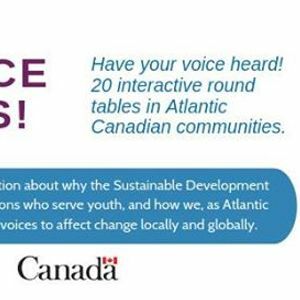 - Why are the SDG’s important to Atlantic Canadians, especially Atlantic Canadian youth? - What are opportunities and barrier when engaging youth in programming related to the Sustainable Development Goals? - Who in the Atlantic is doing work on the SDGs and where are there opportunities for partnership? The SDGs and The 2030 Agenda is a global framework of action for people, planet, prosperity, peace, and partnership. It integrates social, economic, and environmental dimensions of sustainable development, as well as peace, governance and justice elements. It is universal in nature, meaning that developing and developed countries alike will implement the Agenda. Furthermore, the Agenda includes an overarching principle of ensuring that no one is left behind in the achievement of the SDGs. The SDGs provide a unique opportunity for individuals and organizations from various fields to come together and work towards common goals, while still honouring their unique missions and visions. If you have any questions please contact Jackie at amFja2llIHwgYWNpYy1jYWNpICEgb3Jn and/or 902.431.2311.